Rail systems, trains and operations. “We are now beginning the tender process for the multi-billion dollar construction contract to build the longest and deepest underground rail tunnels in Australia,” Ms Berejiklian said. “There will be a major industry briefing next week to outline the contract structure, allowing the NSW Government to get on with the job of delivering this vital new infrastructure for the people of the North West. Four TBMs are planned to build the twin tunnels, travelling at some 120m a week, as well as eight roadheaders – double what was needed to build the Epping to Chatswood rail link. More than 100 excavators, ranging from 5 to 70 tonnes in capacity, are expected to be used across the project. 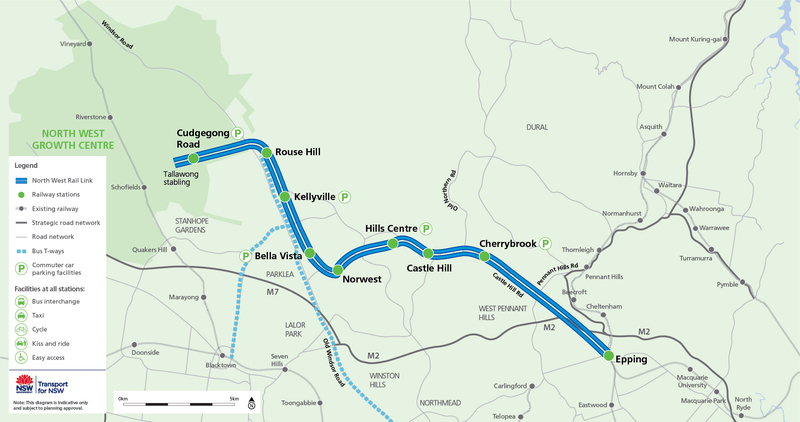 A total of eight new railway stations are also proposed along the alignment at: Cherrybrook, Castle Hill, Hills Centre, Norwest, Bella Vista, Kellyville, Rouse Hill and Cudgegong Road. Sydney’s Rail Future also commits the NSW Government to begin planning for a second rail crossing under Sydney Harbour, which will allow for direct trains from the North West to the Sydney CBD via Chatswood, and beyond. The tunnel will be the first ‘heavy rail’ tunnel under Sydney Harbour. The NSW Liberals & Nationals Government is investing $3.3bn into the North West Rail Link over the next four years, with $360M in this year’s State Budget alone.